Russ Wernimont Steel LS2 21 Front Fender 84-13 Harley Davidson Softail FXST FXS. 21" x 5.5" x 43. 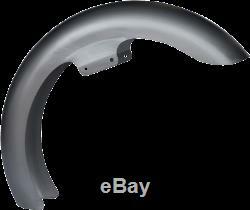 CUSTOM SOFTAIL FRONT FENDER Use this fender when you are running a front fat 120 wide tire. NOT MEANT FOR STOCK WHEELS BEING STOCK WHEELS ARE TOO NARROW. No spacers needed for 84-13 FXS/FXST. LS-2 style fenders follow the curvature of the wheel/tire and have a straight-cut lower edge. FITS THE FOLLOWING SOFTAIL MODELS. Softail Custom (EFI) - FXSTC. Softail Night Train (EFI) - FXSTB. Softail Night Train - FXSTB. Softail Night Train Injected - FXSTB I. Softail Standard (EFI) - FXST. Softail Standard Injected - FXST I. The item "Russ Wernimont Steel LS2 21 Front Fender 84-13 Harley Davidson Softail FXST FXS" is in sale since Friday, August 25, 2017. This item is in the category "eBay Motors\Parts & Accessories\Motorcycle Parts\Body & Frame\Fenders". Size: 21" x 5.5" x 43"